As the vaping phenomenon that has recently developed continues to grow, so too does the number of celebrities that have been seen to ditch the traditional cigarettes and begin to vape using vape mods. If you are interested in joining this new and growing trend, considering the amount of nicotine in a cigarette, be sure to get a hold of a product like these E cigarette kits to get started! So who exactly are some of these female celebrities, who we have spotted vaping? Famous for her roles in ‘Grey’s Anatomy’ and ‘The Ugly Truth’, in addition to the multitude of other films that she has starred in, Katherine Heigl is no stranger to the world of vaping. After having caused quite a stir on the ‘David Letterman Show’, she has been very open about her use of e-cigarettes and is often seen using vape mods on a regular basis as part of her daily life. As one of the most popular models in the world right now, Cara Delevingne is the next female celebrity who we have spotted with an e-cig rather than a traditional cigarette in her hand. There have been many occasions when she has been photographed using her vape pen when modeling, which could be a factor as to why the hype for vaping has increased. 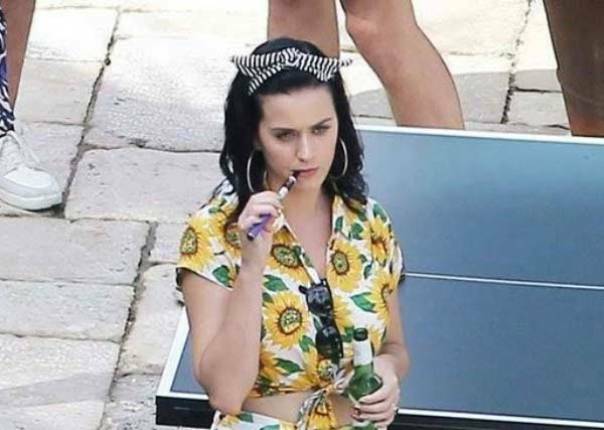 Katy Perry, one of the most famous female pop stars in the 21st century, has also been seen vaping at a party using a vaping pen. This could come as a surprise to many of her fans who thought that she did not condone smoking; however, this could be her way of cutting back on tobacco once and for all. Most famously known for her role in ‘Now You See Me’ and ‘Confessions Of A Shopaholic’, this star is no stranger to vaping both on and off the screen. Whether it is during her personal life or as a character for a film, this star is known to enjoy vaping an e-cigarette. Well-known for her controversial past, as well as staring in a number of great films when she was a child, it has become evident in recent months that this famous actress also vapes. She is often seen smoking an e-cigarette whilst walking around her home and town. We don’t know exactly when she took up vaping, but we do know that she has been enjoying an e-cigarette since. Sarah Silverman is yet another celebrity face that has been seen enjoying an e-cig. Due to it being a healthier alternative to traditional cigarettes, we can see why so many female celebrities have been taking to this new trend. After famously showing off her vaping pen at the Emmy Awards on the red carpet, the internet has fallen in love with Sarah Silverman and her humor just a little bit more. Most famously known for her role as Letty in the very popular ‘Fast And Furious’, Michelle Rodriguez is also partial to vaping. The actress has been photographed many times vaping at the beach or out and about during her everyday life. She was even spotted vaping at a basketball game with her then-girlfriend, Cara Delevingne. We are beginning to notice more and more celebrities who are vaping. E-cigarettes have become a trend, which has encouraged many, including these featured female celebrities, to ditch the traditional cigarettes and move on to vaping a healthier alternative.